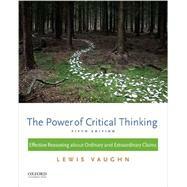 The Power of Critical Thinking: Effective Reasoning About Ordinary and Extraordinary Claims, Fifth Edition, explores the essentials of critical reasoning, argumentation, logic, and argumentative essay writing while also incorporating important topics that most other texts leave out, such as "inference to the best explanation," scientific reasoning, evidence and authority, visual reasoning, and obstacles to critical thinking. Lewis Vaughn is the author or coauthor of numerous books, including Philosophy Here and Now: Powerful Ideas in Everyday Life, Second Edition (2015), Living Philosophy: A Historical Introduction to Philosophical Ideas (2014), Philosophy: The Quest for Truth, Ninth Edition (2013), The Moral Life, Fifth Edition (2013), and Bioethics: Principles, Issues, and Cases (2012), all published by Oxford University Press. He is the former editor of Free Inquiry and the former executive editor and cofounder of Philo.